The Kasai is the first Vagabond boat that I designed, so I put in a lot of thought and design time to make sure that it accomplishes our design goals. 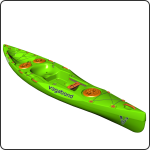 When we started Vagabond, my vision was to create a range of kayaks that bridge the gap between conventional recreational kayaks and high-performance kayaks that can only be paddled by highly-skilled paddlers. I wanted to create kayaks that have the stability of conventional recreational boats but that are fun to paddle by anyone, including highly skilled paddlers. When I pitched this vision to my partners, who are all highly experienced paddlers too with backgrounds and experiences different to my own, they were in full agreement. The biggest challenge with any kayak design is to get the hull right. I wanted to develop a hull that is very stable but also very efficient in its forward motion. My aim was to achieve a hull that offered minimal drag, proper glide, good tracking but at the same time also easy turning. Just as important, I wanted an elegant hull design that wouldn’t look like a bunch of different ideas pieced together. Instead of being influenced by what other recreational boat designers are doing, or even by my own recreational designs of the past, I went back to the core principles of hydrodynamics. I realised that the vast majority of recreational kayaks on the market suffer from the same drawbacks, which create unnecessary drag as a result of trying to gain maximum stability. Some of these design flaws are the result of ‘doing what everybody does’, some result from manufacturing constraints (it is easier to rotomould hulls with lots of grooves and edges), and some probably result from a lack of understanding of fluid dynamics. With a fresh start at Vagabond, I have benefited from the opportunity to look at this problem with fresh eyes. With the Kasai, I ended up with a hull design that I believe has elegance in its simplicity. All of my design goals have been met and, if I may say so, even surpassed. The hull has the same stability as other much wider recreational boats; but it glides, it tracks really well and when you want to turn, it only takes a sweep stroke or two to go in a completely different direction. Once the hull design was done, I began working on the cockpit. I wanted to create a cockpit that is comfortable and that allows for efficient paddling strokes. I shaped a seat that actually holds you in place, and that is comfortable to sit in for hours without the help of foam pads. I drew on my racing experience to create a footwell that keeps your feet together, instead of placing them wide apart – as is the case in most recreational sit-on-tops. It is impossible to have an efficient paddling style with your feet wide apart, so having your feet together was an important aspect of the cockpit. Having the feet together created space for another feature that was really important to me: scoops on the sides of the deck that allow for a much more natural and efficient paddling stroke. These Paddle Cutaways are normally only found on high-performance racing and touring kayaks. Why? Should recreational paddlers not paddle efficiently too? This feature alone makes the Kasai a real pleasure to paddle, compared to just about any other recreational boat of similar size on the market. To complete the cockpit, I added one more feature that is sorely lacking in all sit-on-tops: a Stand-up Platform. In a sit-inside kayak (whitewater, racing, etc), you can pull your feet up, right against the seat, to stand up (while holding onto something) to get out of the boat. But, for most sit-on-tops, this is simply not possible. There are always features in front of the seat that makes it impossible to pull the feet closer, which makes getting up and getting out very challenging. I created a flat platform right in front of the seat, between the seat and the footwell, that allows you to place your feet flat, next to each other, to be able to stand up. This platform lies a bit lower than the footwell, which, combined with the natural stability of the hull, makes it possible for just about anyone to stand upright in the Kasai without holding onto anything. With the cockpit done, I used the rest of the deck to incorporate the most efficient combination of hatch pockets, a tankwell area and positioning of a bunch of our Multifits. The Kasai is a recreational boat, yes, but it has more than sufficient packing space to do multiday trips. I also added a proper groove with a bungee/hook setup to create a Paddle Rest, as well as a handy pocket on the side of the cockpit for a water bottle. With all of these features, together with the Scupper Venturis and properly positioned Drain Plug, I’m confident that I have created a recreational kayak with the stability to please the most inexperienced paddler, while also having the performance characteristics that will make experienced paddlers fall in love with it.